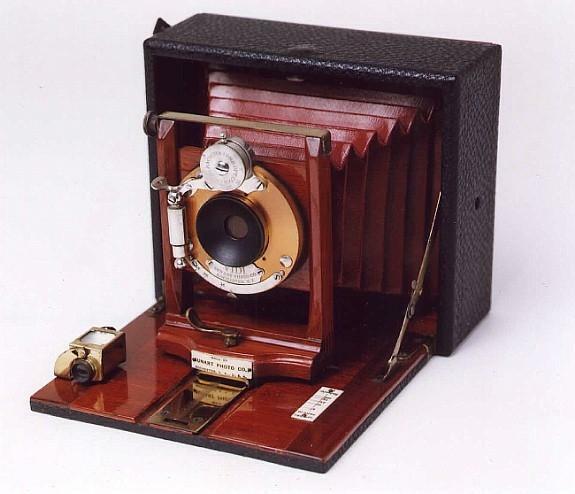 This folding camera was manufactured by the Sunart Photo Company of Rochester, New York. 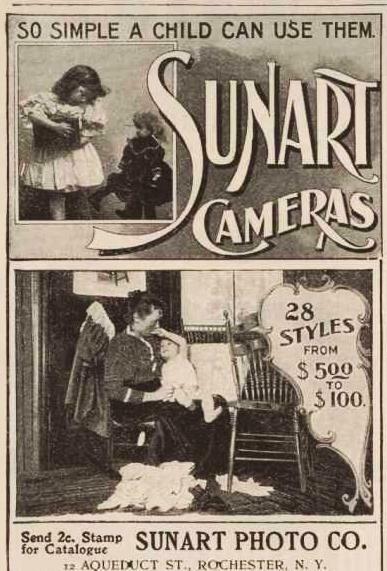 "The Sunart Photo Company was founded in 1893 at 1 Aqueduct Street [Rochester, NY ], and it continued in that location until 1899. They made a novel magazine camera, but it was not particularly successful, and in 1899 its assets were acquired by a vigorous group of men who were establishing the Seneca Camera Company at 248 Mill Street. The new company was incorporated in 1900 with a capital of $25,000. The first officers were Frank T. Day, a superintendent at Kodak Camera Works, president; William C. Whitlock, vice-president; and Lorin E. Mason, a hardware merchant at 348 State Street, secretary and treasurer. The new company quickly became established as one of the most successful camera manufacturers in the country." So writes Rudoplh Kingslake in his dissertation on the early American photographic companies. This style of folding camera was made in rather significant numbers from about 1890 thru 1910. Manufacturers such as Rochester Optical, who sold the "Premo" series of cameras; Rochester Camera, who marketed the "Poco" camera line; Kodak, Century Camera, Gundlach, Manhattan Optical, Ray Camera, Korona, Anthony, Seroco, Seneca and many other small camera houses - all participated in selling rather inexpensive, easy to carry, plate cameras for the large amateur photographer market. However, due to the fact that Sunart ( what a great name for a camera company ! ), was only in business for six years, Sunart cameras are generally difficult to locate today. For every "Sunart" camera you'll find on ebay or at local shows, you'll probably encounter thirty "Premo" cameras along the way. Although the scarcity of the Sunart cameras should be reflected in higher prices than other manufacturers, that is typically not the case. This type of camera is generally valued for its pure aesthetic pleasure rather than as a serious photographic tool. Everyone from crusty old camera collectors to wide eyed "newbies," find these cameras to be the "eye candy" of the camera collecting world. Because of that fact, collectors typically lump them all into one bucket in terms of value. In addition, because of their beautiful features, condition has an enormous impact on their value. Pristine examples generally fetch anywhere from $ 150 to $ 225 depending on the features and manufacturer; while cameras in fair condition ( possibly with a missing carrying strap, and/or torn exterior leather ) run about $ 75 to $ 100. A camera with black bellows, as opposed to red, commands a lower premium, as it tends to detract from the beauty of the rest of the camera. Since these cameras folded themselves up into a box, the interiors are almost always found to be in excellent condition - its the exterior that absorbs the ravages of time. The construction of this camera was commonly referred to as a "cycle" style. This termed was used because bicycles were a popular and common way for the average American to get around town as well as parade through the country with. This type of camera, when folded up and closed, was quite small and light - perfect to carry around on a bicycle trip. The majority of these cameras were built almost identically. The commonly found size is 4 x 5 inches. The next most common would be 5 x 7, followed by 8 x 10. The larger sizes are far more scarce than the 4 x 5, because if a person could afford the larger sized cycle camera, they could also afford the far more versatile and better made, all wood traditional view cameras of the day. The cameras were constructed of wood with the exterior of the camera having a pebble grained leather covering ( or "leather-like" material ), and almost always displayed a polished cherry or mahogany wood interior. The metal trim of the camera was commonly done in brass or nickel, and the tapered leather bellows were black or bright cherry red. The lens, on all but the cheapest models, was generally a four element, rapid rectilinear type lens. Bausch and Lomb ( "B&L" ) supplied many of these lenses to most of the manufacturers of the time. The shutter was also commonly supplied by B&L or Wollensak. B&L's most frequently encountered shutter was called the "Unicum," while the Wollensak frequently supplied the "Uno" shutter. Many sellers of these cameras would not necessarily manufacture the actual camera. Very often, one company would manufacturer and assemble the camera, and the camera house would label the camera their particular brand name. For example, the Seroco line of cameras were sold by Sears, Roebuck and Co. ( "SE-RO-CO" ), yet they were all manufactured by other company's such as Rochester Optical. Sears, to this day, still practices this type of renaming of products produced by other firms. These cameras were generally affordable to most people. Priced anywhere from $ 8 to $ 14, depending on the number of features and options, these cameras were marketed heavily to the consumer who dreamed of becoming the next William Henry Jackson. The cheapest versions of these cameras had a very simple, meniscus lens (one element), combined with a simple shutter featuring one to four different speeds. Although this low level camera seems rather spartan to us today, having used this camera in actual practice, the 4x5 negative size really makes up for any inadequacies in the simple lenses utilized. The high-end, cycle camera would have featured a well known lens of the day, such as the German "Dagor" or Zeiss Anastigmat lens, in a B&L shutter featuring a full range of shutter speeds from 1/100 of a second, down to 1 second with Time and Bulb. A 4 x 5 camera, with these options could run as high as $ 25-30. The demise of these beautiful, yet simple machines was basically due to George Eastman. Eastman's goal of producing cheap cameras for the masses that utilized roll film, rather than the heavier and more complicated dry plate, made these cameras go out of favor very quickly. Despite many makers attempts to have these cameras utilize glass plates or roll film, they just couldnt compete with $ 1 Brownie cameras for simplicity, price and commerical photo processing. From a collecting standpoint, these cameras continue to be under valued. Although they are relatively plentiful, and most survive in nice condition, their appeal is somewhat lackluster among collectors. Collectors who focus on pre 1900 cameras generally focus on older, all wood view cameras. The next area of focus for many collectors then seems to be Kodaks or early 35mm cameras. The other factor that likely hampers their overall collecting appeal is that these camera are primarily an American "invention," and are not common "across the pond." Hence, these cameras are somewhat lost in the timeline of collectible photographic apparatus. Although everyone appreciates their beauty, I dont know of too many collectors that focus all of their collecting and research efforts on these style of cameras.